I always feel like Valentine's Day is my warm up for the cuteness overload of Easter. Hearts, love, romance, all piled up in an overdose of red and pink that blends seamlessly into the twee pastels of Official Candy Holiday in April. I love both because they give me ample opportunity to spread the love with some sugary treats. (And fruits and stuff, too, but whatever). 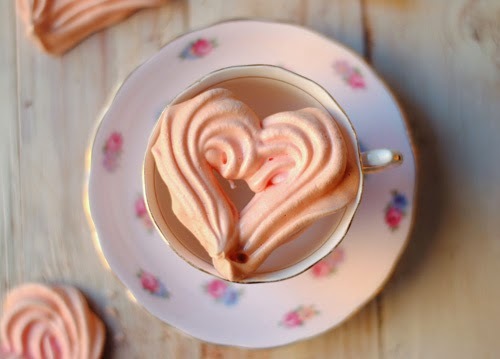 Meringue hearts are an easy, low fat (if you're into that sort of thing) dessert to give your sweetheart or pass around the office. They're light, airy, and with the perfect subtle sweetness. I made these ones candy cane flavoured, but you can use whatever extract you'd like. Pour into a (very very) clean bowl of a stand mixer, and add the candy cane flavouring. Beat on medium for a few minutes, and then add the food colouring. Aim for a dark pink because it will lighten up considerably when things whip up. Using a large star tip, pipe the meringue into heart shapes, about two inches wide, directly onto the parchment. Bake for 20-40 minutes, and allow them to cool inside along with the oven.